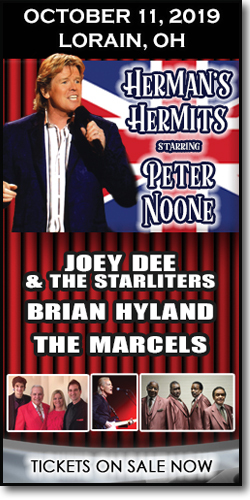 60s Concert | Lorain, OH | Herman's Hermits starring Peter Noone & more. Pre-Sale for Insiders is on now! Public on-sale 4/16/19 at 10 am. 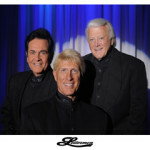 Stars of the 60s return to Lorain! Herman’s Hermits starring Peter Noone will rock the Lorain Palace, singing all their hits like “I’m Into Something Good”, “I’m Henry VIII”, “Mrs. Brown You’ve Got a Lovely Daughter”, “A Kind of Hush”, “Can’t You Hear My Heartbeat” and more! Plus… Joey Dee & the Starliters (“Peppermint Twist”, “What Kind of Love is This”), Brian Hyland (“Itsy Bitsy Teenie Weenie Yellow Polka Dot Bikini”, “Gypsy Woman”, “Sealed With a Kiss”) and The Marcels (“Blue Moon”, “Heartaches”). Presented by Pop, Rock & Doo Wopp Live!